The turn is the [9d] and the river is the [As]. Solerti's kings hold up and Mason is eliminated in 7th place for $9,054. Daniel Chan raises to 90,000 before the flop and is called by Danny Smith in the small blind and Frank Callucci in the big blind. Callucci has the lead with two pair as Smith and Chan both hold flush draws. However, Smith also has a straight and straight flush draw. The turn is the [2d] and the river comes the [3h]. Callucci's two pair hold to eliminate Chan in 8th place for $7,270. Marchese has Smith dominated until the board comes [As][Kh][3d][Td][8h], giving Smith a straight. Marchese is eliminated from the $600 Deep Stack in 9th place for $5,961. A short-stacked Kevin Wojtaszek is all-in before the flop with [Ah][9s] against the [6c][6h] of Dean Borders. The board runs out [Th][6d][2c][4c][8h] and Wojtaszek is eliminated from the $600 Deep Stack in 10th place for $3,595. Day 2 of the $600 Deep Stack event is now down to 14 players. We will bring you full chip counts and seat assignments once we reach the final table. You can watch the action on our live stream by clicking "Watch LIVE Video" at the top of the page. The $400 Deep Stack event kicked off today with 461 players and is now down to 113. The final 50 will finish in the money. The final two players in the $400 7-Card Stud event have come to an agreement on an even chop. Eugene Sumter and Michael Mann are officially Co-Champions of the event! We are down to 18 players and the final two tables of the $600 Deep Stack event. The players will be taking a dinner break at approximately 7:45pm. The blinds are currently 8,000-16,000 with a 2,000 ante. The average chip stack is now 575,000. 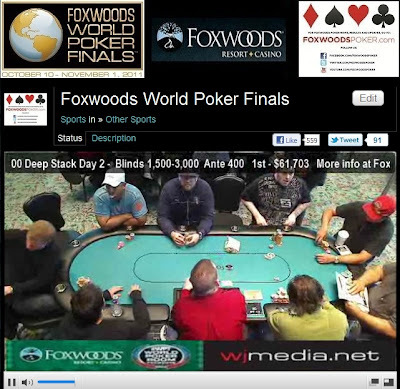 We had a total of 461 players in the $400 NLHE Deep Stack event at the Foxwoods World Poker Finals. $600 Deep Stack is in the Money! With 57 players remaining, we lost two players on the same hand. All 55 remaining players are now in the money. $600 Deep Stack Final Day Now Streaming Live! The final day of the $600 No-Limit Hold 'em Deep Stack event is now streaming live. Just click "Watch LIVE Video" at the top of the page to view to live feed. The 73 remaining players in the are starting to take their seats and play will be in about 10 minutes. The blinds will be starting off today at 2,000-4,000 with a 400 ante. The $400 No-Limit Hold 'em Deep Stack event at the Foxwoods World Poker Finals is underway. Players start with 20,000 in chips and the levels are 40 minutes in length. The blinds are currently 25-50. Play has come to an end on Day 1 of the $600 No-Limit Hold 'em Deep Stack event with about 75 players remaining. Play will resume tomorrow at noon with the blinds at 2,000-4,000 with a 400 ante. End of Day 1 chip counts will be posted shortly.